Preliminary comment...All kinds of Awesome. More tomorrow. OK, I'm awake now and ready to let you in on my deep and analytical consideration of this complex and emotionally challenging gem of human drama. Not really. This is a straight out gore soaked, high intensity, disturbing shockfest. It is exactly what I wanted the movie to be. I came to the "Evil Dead" series a little late and I sort of hate myself for it. I remember seeing the poster at the "Alhambra/Gold Cinema" movie duplex back in 1981 and thinking that it looked messed up, but for some reason I did not make it out to the show. I saw a little activity from the film community when "Evil Dead II" was in theaters, but again I did not get off the couch and head to a cinema. Sometime in 1990, my friends the Yennys and the Rollinos, ended up watching "Evil Dead II" on video, I think at a Halloween party, and as John Yenny passionately defended his choice of film to others, I became convinced there was something there. At a comic book store near where I taught, they had "Evil Dead" on continuous loop and it was wild. I rented the two films and quickly became a champion myself. These movies were no holds barred fright films with a generous amount of gore to keep one disturbed for days. They also had a sly sense of humor, even the most serious of horror hounds was likely to appreciate. Most of us who love movies rail against remakes, suggesting they reflect the bankrupt creativity of film studios who must pillage the past to find material to generate revenues. Over the past dozen years there have been dozens of horror films remade, utilizing the new technology available to achieve effects and then watering down the product enough to get a PG 13 rating to have a bigger audience. I don't automatically recoil at a remake, and there are a few instances where bringing the story to a new audience has resulted in superior entertainment. Those cases are usually the exception. This version of "Evil Dead" is one of those exceptions and a big reason that it is an exception is that the film makers abandon most of the tools of contemporary technology and go old school with their effects. There is no CGI blood in this movie, it is all on the set and the props and the actors. The blood soaked story uses galleons of crimson liquid to bring this tale to life (I love the irony of that sentence). One of my favorite things about horror films is the use of make up. In most modern films the make up effects are computer enhanced and I often feel like I am looking at a cartoon. You won't have that feeling here because the gruesome make up consists of brilliant use of appliance and prosthetic. When faces are mangled or limbs severed, it is all done in camera and it looks great. Rick Baker can be proud of the descendants he has spawned in this field. Tom Savini can sleep soundly knowing that his skills have inspired others. "Evil Dead" practically invented the Cabin in the Woods premise of horror films. Typically a group of young people, isolated from the civilized world, are forced to cope with evil on their own with little chance of respite. A creative and successful innovation for this telling of the tale is to make this visit to the woods a serious intervention for a drug addict rather than just a picnic for horny teens. It makes it all the more believable that the cast would be slow to respond to some of the events taking place. 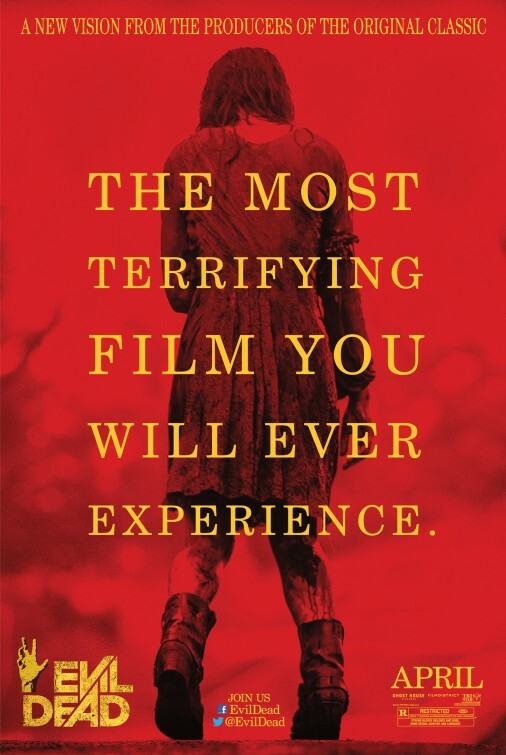 In the world of the Evil Dead, spirits are possessed, the living are abused, and the only hope of overcoming any of it usually depends on taking the most extreme measures possible. All of that happens in this movie. I don't think it counts as a spoiler to say that most of the cast does not make it out of the story alive. In fact, most of the cast does not make it out of the story in one piece much less alive. The deaths and attacks are not morbidly lingered over like some torture based film. These events happen quickly, in a shocking manner and while they are sometimes disgusting, they manage to be scary more frequently than merely gross. Somewhere in my role as parent, I brought my children with me to the dark side. My youngest daughter (she is now 24), loves tea parties, Winnie the Pooh, Alice in Wonderland, and gore flicks. She and I have seen countless horror films in the last few years and have rarely been satisfied. Last night, she saw only half the movie, the half you can see from behind your hands or the jacket pulled up around your face. She pretty much had the same reaction I did,muttering as we walked out of the theater,"Oh God, Jesus, and What the f***." 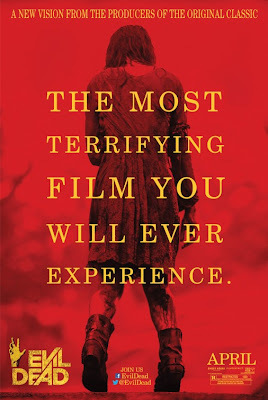 The movie was scary good and has everything you could want as a fan of horror films. to provide the exposition back in 1981(Bob Dorian, the host of AMC channel movies for many years and perhaps the inspiration for having Robert Osbourne host on TMC, provided the voice on the recorder). And if you are a real fan of the series, you will want to sit through the credits to get the one wink and nod that most "Deadites" crave the most. A movie like this is not really subject to some of the same standards one might apply to other stories. When people are slow to react, it's not because they are stupid, it is just part of the order of things. There is not always a clear explanation or a sense of logic to the events. One character put it this way, when asked if he was sure if the action being planned would work, he said "I'm not sure of anything". That is pretty much the way I think most of you will feel, uncertain as to what is going to happen next. Eric, the same character also responds when David tries to reassure one of the others that everything is going to be fine says "Everything's gonna be fine? I don't know if you noticed this, but everything's been getting worse... every second". That's what we want from a movie like this, we want it to keep ratcheting up the tension, squeezing out the scares, and making us laugh at our own fears while cringing behind our hands. I really enjoyed this one too. The appearance of the Olds is exactly the moment I was talking about in my review where all of a sudden, you're hit with 4 or 5 references in a single scene. Mia's wearing a Michigan State sweatshirt, drawing on a tablet, sitting on the goddamn Olds... and then, Love Monocle.